Thirty years of award-winning teaching in New York City’s public schools led the Author J.T. Gatto to the sad conclusion that compulsory government schooling has nothing to do with education, doing little but teach young people to conform to the economy and the social order. ”Dumbing us Down” reveals the shocking reality of today’s school system and has become a beacon for parents seeking alternatives to it. 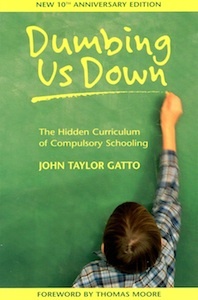 Gatto provided the key to understanding that schools are not failing. On the contrary, they are spectacularly successful in doing precisely what they are intended to do since they inception. The system, perfected at places like the University of Chicago, Columbia Teachers College, Carnegie-Mellon and Harvard, and funded by the captains of the industry, was explicitly set up to ensure a docile, malleable workforce to meet the growing, changing demands of corporate capitalism. The COMBINE ensures a workforce that will not rebel, that will be physically, intellectually and emotionally dependent upon corporate institutions for their incomes, self-esteem, and stimulation.